First Man is a 2018 American biographical drama film directed by Damien Chazelle and written by Josh Singer. 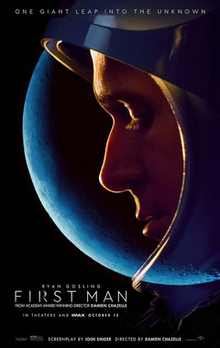 Based on the book First Man: The Life of Neil A. Armstrong by James R. Hansen, the film stars Ryan Gosling as Neil Armstrong, alongside Claire Foy, Jason Clarke, Kyle Chandler, Corey Stoll, Ciarán Hinds, Christopher Abbott, Patrick Fugit, and Lukas Haas, and follows the years leading up to the Apollo 11 mission to the Moon in 1969. Steven Spielberg serves as an executive producer. The project was originally announced in 2003, with Clint Eastwood slated to direct. After that rendition fell though, Chazelle, Gosling and Singer all signed on by 2015, and principal photography began in Atlanta, Georgia in November 2017. First Man had its world premiere at the Venice Film Festival on August 29, 2018, and was theatrically released in the United States on October 12, 2018, by Universal Pictures. The film received critical praise, particularly regarding the direction, Gosling and Foy's performances, musical score, and the Moon landing sequence, although its choice to not depict the planting of the American flag on the lunar surface led critics and politicians from both political parties to debate the film's stance on patriotism. It grossed over $100 million worldwide against its $59 million production budget, and received numerous award nominations, including two nominations for Best Supporting Actress (Foy) and Best Original Score (winning the latter) at the 76th Golden Globe Awards and seven nominations at the 72nd British Academy Film Awards. The film also received Academy Award nominations for Best Sound Mixing, Best Sound Editing, Best Production Design, and Best Visual Effects at the 91st Academy Awards. Plot: In 1961, NASA test pilot Neil Armstrong is flying the X-15 rocket plane when it inadvertently bounces off the atmosphere. Although he manages to land the plane in the Mojave Desert, his colleagues express concern that his recent record of mishaps is due to distraction and he is grounded. His two-and-a-half year old daughter, Karen, is undergoing treatment for a brain tumor. Desperate to save her, Armstrong keeps a detailed log of her symptoms and feverishly tries to find possible treatments, but she dies soon afterwards. Grief-stricken, Armstrong applies for Project Gemini and is accepted to NASA Astronaut Group 2. Armstrong, his wife Janet, and their son Rick move to Houston alongside other astronaut families. Armstrong befriends Elliot See, another civilian test pilot, and Ed White. As Armstrong begins training, Deke Slayton impresses upon the new astronauts the importance of the Gemini program, as the Soviet Union had reached every milestone in the Space Race ahead of the United States. Armstrong and Janet have a second son, Mark. By 1965, the family has settled in Houston, and Armstrong awaits selection for a crew. After the Soviets complete the first extravehicular activity (EVA), Armstrong is informed that he will be the commander of Gemini 8, with David Scott as the pilot. Prior to the mission, See and Charles Bassett are killed in a T-38 crash, deepening Armstrong's grief at the string of recent losses. Armstrong and Scott successfully launch on Gemini 8, and dock with the Agena target vehicle, but soon afterward, the spacecraft begins to spin at a rapid rate. After nearly blacking out, Armstrong activates the RCS thrusters and safely aborts the mission. Armstrong initially faces criticism, but NASA determines the crew is not at fault. Later, White reveals that he has been selected for the Apollo 1 mission along with Gus Grissom and Roger Chaffee. During a launch rehearsal test on January 27, 1967, a fire kills the Apollo 1 crew, and Armstrong hears the news while representing NASA at the White House. The next year, after nearly being killed ejecting from the Lunar Landing Research Vehicle, Armstrong is selected to command Apollo 11, and Slayton informs him that it will likely be the first lunar landing. As the mission nears, Neil becomes more and more preoccupied and emotionally distant from his family. Just prior to the launch, Janet confronts Armstrong about the possibility that he won't survive the flight, and insists that he explain the risks of the mission to their young sons. After telling them about the risks he faces, Armstrong says goodbye to his family and departs. Apollo 11 successfully launches, and arrives at the Moon on the fourth day out. Armstrong and Aldrin undock in the Lunar Module and begin the landing attempt, but as they descend towards their landing site, Aldrin realizes the area is full of large boulders, forcing Armstrong to take manual control of the spacecraft. The lunar module successfully lands with minimal fuel remaining. After setting foot on the Moon, Armstrong drops Karen's bracelet into Little West crater. With their mission complete, the astronauts return home and are placed in quarantine, where a rerun of JFK's 1962 speech "We choose to go to the Moon" is shown, and Armstrong and Janet share a moment of tenderness.